Among major U.S. allies in Western Europe, seven-in-ten British and six-in-ten Italians currently say they feel at least somewhat favorably toward the United States. That represents a significant shift since the prewar survey by the Pew Global Attitudes Project (March 10-17, 2003), when only about half the British (48%) and a third of Italians (34%) expressed favorable views of the United States. 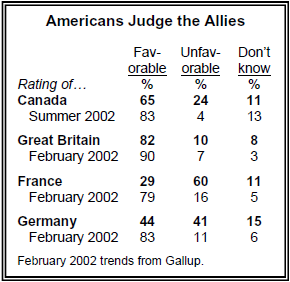 In Germany, France and Spain, favorable views of the U.S. also have increased from their abysmal prewar levels. Even so, fewer than half in all three have positive opinions of the United States (Germany 45%, France 43%, Spain 38%). As recently as last summer, more than six-in-ten French and Germans (61%) expressed favorable views of the U.S.
Aside from Great Britain and Italy, majorities in only five other countries express favorable views of the U.S.: Israel (79%), Kuwait (63%), Canada (63%), Nigeria (61%) and Australia (60%). Even in some of these countries, however, the U.S. image has slipped. Last summer, 77% of Nigerians had positive feelings toward the U.S., compared with 61% in the current survey. Fewer than four-in-ten Russians (36%) say they have a very or somewhat favorable view of the U.S., compared with 28% in the prewar survey. That is well below the 61% who gave the U.S. positive ratings in the 2002 poll. People in most predominantly Muslim countries remain overwhelmingly opposed to the U.S., and in several cases these negative feelings have increased dramatically. Fewer than one-in-five Indonesians (15%) have positive views of the U.S., compared with 83% with unfavorable opinions. That represents a complete reversal since last summer, when by a wide margin (61%-36%), Indonesians expressed favorable opinions of the U.S.
Just 15% of Turks have positive feelings toward the U.S., about the same as in March (12%), but far fewer than in 2002 or 2000 (30% and 52%, respectively). 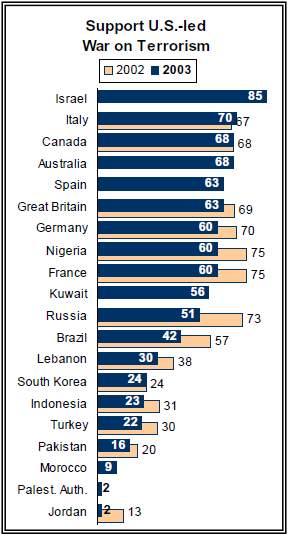 Even in Nigeria – aside from Kuwait, the only largely Muslim country in which a majority has a favorable view of the United States – Muslims are far less supportive of the U.S. than are non-Muslims. Only about four-in-ten Muslims in Nigeria (38%) have favorable views of the United States, compared with 85% of non-Muslims. Anti-U.S. sentiment is virtually unanimous in Jordan and the Palestinian Authority (99% and 98% unfavorable, respectively). The intensity of this opinion is striking. More than eight-in-ten Palestinians (85%) and Jordanians (83%) say they feel very unfavorably toward the U.S., far more than any other public. Disagreements over Iraq and other policies also have taken their toll on American attitudes toward France and Germany. Fewer than three-in-ten Americans (29%) say they have very or somewhat favorable views of France, while twice as many (60%) feel negatively. In a little over a year, opinion of this traditional U.S. ally has shifted dramatically. In a February 2002 Gallup survey, 79% of Americans had positive opinions of France, compared with just 16% who felt negatively. Germany‘s image in the U.S. also has taken a hit, though Americans view Germany much more favorably than they do France. The U.S. public is divided in its assessments of Germany – 44% feel favorably, 41% unfavorably. In February 2002, nearly twice as many Americans had positive impressions of Germany (83%). Positive views of Canada also have slipped since last summer, though they remain overwhelmingly favorable (65% now, 83% then). American attitudes toward Great Britain are by far the most positive of the four countries tested: 82% say they have favorable views of Great Britain, down somewhat from February 2002 (90%). Traditionally, people around the world tend to take a positive view of Americans, even where most dislike the United States and oppose U.S. policies. Majorities in 14 of the 21 publics express favorable views of Americans. But several Muslim populations express negative views of Americans, as well as America. Nine-in-ten Palestinians (92%) and eight-in-ten Jordanians (82%) say they feel somewhat or very unfavorably toward Americans. In Jordan, hostility toward Americans is on the rise; last summer, fully half of Jordanians (53%) had a positive view of Americans, a number that has fallen to 18% in the current survey. Negative views of Americans are not limited to Muslim populations. 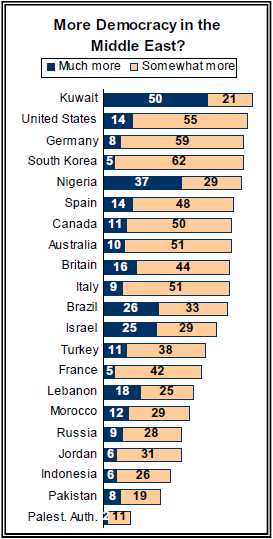 Fewer than half of those in Spain (47%), a NATO ally, have a positive impression of Americans. Only about four-in-ten Brazilians (43%) view Americans favorably, down from 54% in summer 2002. People in most other nations continue to have high regard for Americans. This is the case even in countries like Indonesia, where most have a negative view of the United States. More than half of Indonesians (56%) say they feel favorably toward Americans, though this is down from 65% last year. In South Korea, where the image of the U.S. is mixed (46% positive, 50% negative), an increasing number say they have a good opinion of Americans (74%, up from 61% last summer). People who have unfavorable views of the United States for the most part base those opinions on their feelings about President Bush, not the United States generally. This view is especially widespread in some Western European countries. In France and Germany, nearly three-quarters of those who have negative views of the U.S. say their opposition is to the president, rather than America generally (74% each). Two-thirds of Italians (67%) and six-in-ten British (59%) who have negative views of the U.S. say the same. U.S. critics in largely Muslim nations also tend to blame the president, not a more general problem with the U.S. Nearly seven-in-ten Indonesians (69%) who have a negative view of the U.S. cite their feelings about the president, as do majorities in Morocco (66%), Pakistan (62%), Nigeria (60%), Turkey (52%) and Lebanon (51%). People who have the most negative views of the U.S. – Palestinians and Jordanians – are more divided in their assessments of whether the president or America generally is to blame. A plurality of Jordanians (42%) blames Bush, while a plurality of Palestinians (36%) volunteered “both,” when asked whether the president or the nation is to blame. South Koreans are divided in their view of the United States, with half expressing an unfavorable view. Overwhelmingly, South Koreans attribute this negative opinion to a general problem with America, rather than a problem with the president (72%-20%). In the United States, anger over France‘s and Germany‘s active opposition to the war with Iraq spurred highly visible protests, including a move to rename French fries “freedom fries,” and calls for boycotts of French and German products. One-quarter of Americans have seriously considered such a boycott, and 14% say they have actually stopped buying products from those countries. The idea of boycotting American products is far less popular in France and Germany, despite the widespread criticism in those countries of the United States and its policies. Only about one-in-ten in France and Germany (13% and 12%, respectively) say they have considered not buying American products to protest U.S. policies. About half that number in each country (8% and 6%) say they actually have stopped buying U.S. goods. But anti-American boycotts are more widespread in other parts of the world. Half of Palestinians, nearly as many Jordanians (48%) and more than four-in-ten Turks (43%), say they have considered not buying American products to protest U.S. policies, and a significant proportion say they have actually followed through with that action (37% of Palestinians, 36% of Jordanians and 32% of Turks). Substantial minorities in South Korea (29%), Kuwait (25%) and Indonesia (24%) also have considered boycotting American products. The postwar update survey revisited opinions about American ideas, business practices, and cultural products, first reported in last year‘s Global Attitudes survey (What the World Thinks in 2002). The publics of most nations continue to admire the United States for its technological and scientific advances, and strong majorities in many of them also like American music, movies and television. But large majorities in most countries say they dislike the growing influence of America in their country. If anything, U.S. technology is even more popular than it was last summer. Solid majorities in every country except Russia say they admire U.S. scientific and technological know-how. Even Palestinians, who were not surveyed in 2002 and who generally take a dim view of all things American, have a positive view of U.S. science and technology (62% favorable). Opinions are more mixed on American business practices and American ideas about democracy. As was the case in last year, people around the world generally view the spread of American ideas and customs as a bad thing. In a handful of cases, these attitudes have shifted since last summer – sometimes dramatically – but there has been no consistent pattern to these changes. For the most part, people in the 20 nations surveyed say they agree with the stance their governments took on the war in Iraq, whether it was to participate in military action or to stay out of the conflict. Generally the war did little to change prewar attitudes regarding military action, except in the U.S. and Great Britain, where the success of the war bolstered public support for the use of force in Iraq. In a prewar poll conducted March 14-16, just 39% of British supported their country joining the U.S. and others in taking military action against Iraq. Currently, 61% of the British feel the government made the right decision to use military force in Iraq. The prewar survey also showed 59% of Americans favoring military action; now, 74% believe it was right to go to war. Spain is the notable exception among the so-called “coalition of the willing.” While Spanish military forces had no combat role in Iraq, the Spanish public, by two-to-one, believes their government 25 did the wrong thing in providing even limited support for the coalition effort (62% wrong decision/31% right decision). The Kuwaiti public overwhelmingly agrees with their government‘s decision to allow the U.S. to use bases in that country for military action in Iraq. Fully eight-in-ten Kuwaitis (83%) back that decision, while just 9% disagree. People in countries that stayed out of the war overwhelmingly believe their governments made the right decision. Fully nine-in-ten Israelis (92%) and eight-in-ten French (83%) and Germans (80%) believe their governments made the right decision not to join the allies. Globally, people have very different perceptions of whether the United States and its coalition partners did all they could to avoid civilian casualties in Iraq. Publics in countries that participated in the war – the U.S., Great Britain and Australia – strongly believe coalition forces did all they could to avoid Iraqi civilian casualties. But for the most part, that view is not shared in other countries. Large majorities in most Muslim countries believe the U.S. and its allies did not do enough to avoid civilian casualties. This opinion is virtually unanimous in Jordan (97%) and the Palestinian Authority (95%) and is widely shared in Morocco (91%), Turkey (88%), Indonesia (83%) and Pakistan (81%). The idea that the United States and its allies did too little to avoid civilian casualties also is prevalent in Western Europe – with the exception of Italy – Russia, South Korea and Brazil. In fact, aside from the nations that participated in the conflict, solid majorities in only three countries – Israel (69%), Canada (62%) and Kuwait (59%) – believe that the U.S. and its allies did all they could to avoid civilian casualties. Despite widespread concerns over the way the war was conducted, majorities in most countries – with the exception of several Muslim nations – feel the Iraqi people will be better off because of Saddam Hussein‘s removal from power. However, the United States and its allies receive only middling marks for taking into account the needs of the Iraqi people as they begin the task of rebuilding the country. Majorities in every Western European country surveyed – even those where there was broad opposition to the war – believe Iraqis will be better off now that Hussein has been deposed. Three-quarters in France and Germany (76% in each) believe the Iraqi people will be better off with Hussein ousted, and seven-in-ten in Spain agree. But several Muslim publics believe that the Iraqi people will be worse off now that Hussein is no longer in power. Roughly eight-in-ten Palestinians (85%) and Jordanians (80%) think people in Iraq will be in worse shape with Hussein out of power, and majorities in Indonesia (67%), Pakistan (60%) and Morocco (53%) agree. Among Muslim publics, only in Kuwait and Nigeria do solid majorities believe the lot of Iraqi people will improve in the post-Hussein era (80% and 62% respectively). Most Americans (59%) feel that in rebuilding Iraq, the U.S. and its allies are doing an excellent or good job in taking into account the needs of the Iraqi people. But people in other countries express considerable doubt about how well the allies are doing in that regard – and that is the case even among coalition allies. Roughly half of Australians (53%) and British (50%) say the U.S. and its allies are doing only a fair or poor job in addressing the interests of the Iraqi people. Views of the reconstruction effort are even more negative elsewhere. 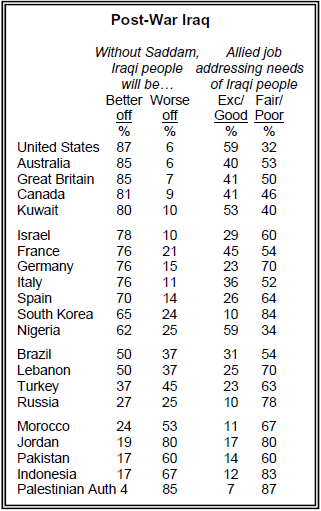 Majorities in Western Europe, Russia, South Korea and most Muslim publics give the allies a rating of fair or poor for taking into account the needs of the Iraqi people as they rebuild the country. That is the case as well in Israel (60% fair/poor), where people give the U.S. and its allies high marks for their conduct of the war. There is moderate optimism that the war on Iraq will lead to broad democratization in the Middle East, as many believe the region will become somewhat more democratic. Majorities in the U.S., Canada and most of Western Europe feel the Middle East will become at least somewhat more democratic with the removal of Hussein from power. For the most part, people in the Middle East do not concur with that opinion. Nearly six-in-ten in Jordan (59%) believe there will be no change in the region as a consequence of Hussein‘s removal, and half of Lebanese agree. A slim majority in Israel (54%) believes the region will become somewhat more democratic. By contrast, just 13% of Palestinians think greater democratization is likely, while 75% expect no change in the region. Kuwaitis stand out for their optimism that Hussein‘s removal will lead to greater democracy in the Middle East. Fully half of Kuwaitis believe the Middle East will become much more democratic as result of Hussein‘s ouster, more than any country surveyed. Another 21% of Kuwaitis think the region will become somewhat more democratic. While there is a growing consensus that the U.N. has become less relevant, overall positive opinions of the world body have also decreased. The percentage of people who say the U.N. has a good influence on their country has declined in nations that took military action against Iraq – including Great Britain and the U.S. – as well as those that bitterly opposed the war. Positive views of the U.N. dropped by 37 percentage points in Great Britain and 29 points in the U.S.; the negative change was nearly as sharp in Germany (33 points) and France (28 points). In an unusual note of agreement, large majorities of both Israelis and Palestinians feel that the U.N. is having a bad influence (63% among the Israelis, and 78% on the Palestinians). Majorities are negative about the U.N. in Jordan, Turkey, Lebanon, France and Brazil, and pluralities are now negative in the U.S., Great Britain and Pakistan. U.N. Secretary General Kofi Annan receives a vote of confidence from majorities in nine of the 21 publics surveyed in the postwar update, with two-thirds or more of the Germans, British, Australians, and Italians saying they have at least some confidence in him to do the right thing regarding world affairs. But majorities in Indonesia, Israel, Lebanon, Turkey, the Palestinian Authority, and Jordan express little or no confidence in the U.N. Secretary General. Compared with last summer, significantly fewer people around the world say they support the U.S.-led efforts to fight terrorism. In 10 of the 14 countries where comparisons are possible, the percentage favoring the war on terrorism has declined. And in Pakistan, there was little change in support but a large increase in opposition. Support for the war on terrorism remains greatest among traditional U.S. allies, including many nations where terrorist attacks have occurred in recent years. Support is strong in Israel (85% favor the U.S. efforts), Italy (70%), Australia and Canada (68% each), Great Britain and Spain (63% each), Nigeria, France and Germany (60% each). But support is down in France and Germany (by 15 and 10 points, respectively). And in Russia, the percentage backing the war on terror has fallen 22 points, to 51%. Fewer than a quarter support the war on terrorism in Indonesia, Turkey, Pakistan, Jordan, and even in South Korea. Just one-in-ten Moroccans (9%) say they back the war on terror. (This survey was conducted before the May 16 terrorist attack in Casablanca). Prior to the war with Iraq, President Bush described what many observers saw as a new doctrine asserting the right of military preemption against potentially hostile nations. But majorities in most of the nations polled believe that the use of force against nations that threaten but have not actually attacked one‘s country is rarely or never justified. Opposition to preemption is particularly widespread in Jordan and the Palestinian Authority, where 93% and 78%, respectively, believe preemption is rarely or never justified. By contrast, majorities in Pakistan, the United States, Israel, Britain, Australia, and Canada say that this policy is often or sometimes justified. Despite their country‘s active opposition to the war in Iraq, a sizable minority in France (42%) supports preemption. Europeans Want Looser Ties to U.S. The publics of many America‘s most important allies favor Western Europe taking a more independent approach to security and diplomatic affairs than in the past. 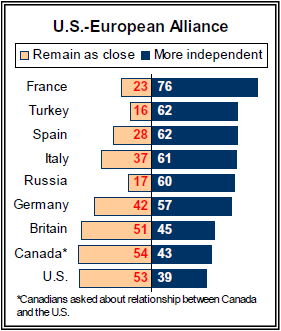 But even in the United States, a large minority – 39% – agrees with the idea of loosening the partnership, and 43% of Canadians want their country to have a more independent relationship with the U.S. In France and Germany, this sentiment is notably higher than it was in April 2002. Currently, 76% in France favor a more distant relationship with the U.S., up from 60% in 2002 and 67% just before the war with Iraq. The change in Germany was smaller, with support for a more independent approach rising from 52% prior to the war to 57% today. About six-in-ten in Turkey, Spain and Italy also favor looser ties with the U.S., all unchanged from prewar levels. The British are divided, with just over half saying the alliance should remain close and 45% favoring a more distant relationship with the U.S.
America is seen by most publics polled as showing little regard for the interests of other countries in making international policy decisions. This sentiment is overwhelming in most Muslim publics, but is shared by majorities in many of America‘s traditional allies. More than eight-in-ten people in France (85%) say the U.S. does not take French interests into account in making policy decisions, and substantial majorities in South Korea (78%) and Spain (74%), Russia (71%), Canada (70%) believe the United States disregards their countries‘ interests. Exceptions to this pattern include Israel, Kuwait, and Nigeria. In contrast, a large majority of Americans (73%) believe the U.S. takes into account the interests of other countries at least a fair amount. 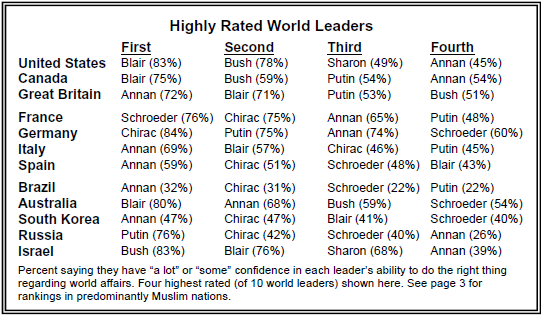 British Prime Minister Tony Blair and U.N. Secretary General Kofi Annan are the leaders who command the greatest level of confidence from the publics of non-Muslim nations surveyed. Blair leads in the United States, Canada, and Australia. Annan is the highest rated leader among the British, Italians, Spaniards, Brazilians and South Koreans. 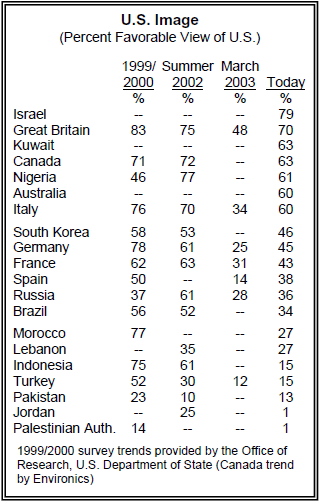 Annan ranks lower in Israel, Russia and the U.S., although nearly (45%) express confidence in him. In France, German Chancellor Gerhard Schroeder finished in a virtual tie with President Jacques Chirac (Schroeder 76%, Chirac 75%); but in Germany, Chirac is by far the highest rated leader (84%). Russians express far greater confidence in President Vladimir Putin (76%) than in any other leader named. President Bush receives a stronger vote of confidence in Israel than in any other country surveyed. Fully 83% of Israelis express at least some confidence in his ability to handle world affairs, and 51% voice a lot of confidence in him. But majorities express confidence in the president in the U.S., Canada, Great Britain and Australia. 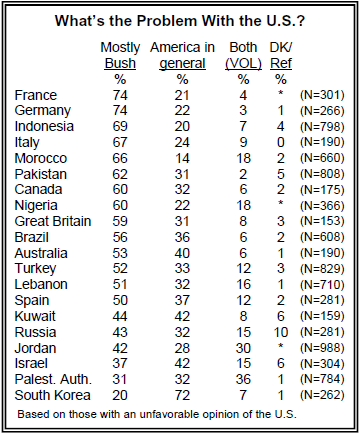 Bush receives very low ratings in Brazil, Russia, Spain, France and Germany. Only in Israel does Prime Minister Ariel Sharon get a majority of the public expressing at least some confidence in his ability to do the right thing regarding world affairs. Nearly all of those polled in Jordan, the Palestinian Authority, Lebanon, Morocco and Kuwait say they have no confidence in Sharon, and large majorities in Turkey, Pakistan, and Spain share this view. With the conclusion of the war in Iraq, North Korea has taken center stage as a threat to peace and stability in the minds of many. Since November 2002, the percentage current government in North Korea as a great or moderate danger to the stability of Asia has risen by 20 points in Germany, 17 points in France, 13 points in Great Britain, and 12 points in the United States. Overall, about eight-in-ten Australians (79%), Germans (77%) Americans (77%) believe North Korea presents a great or moderate danger to regional stability and world peace. Perceptions are different in the Muslim world. 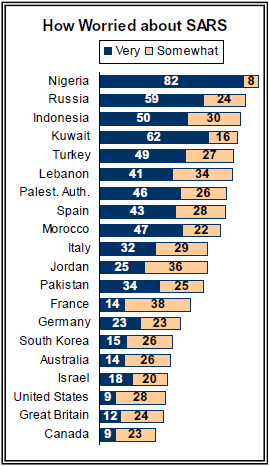 No more than half of the respondents in any Muslim public views North Korea as a great or moderate threat. About one-third or more in Pakistan, the Palestinian Authority, Morocco and Turkey see North Korea as no threat at all. The U.S. and Israel have somewhat similar perceptions of the Middle East, with two-thirds or more in both countries seeing the current government in Syria and Iran as at least moderate dangers to stability in the region. But Israelis are much more likely than Americans to see these countries as major threats. Nearly four-in-ten Israelis (38%) say Syria poses a great danger to regional stability, compared with 22% of Americans. By contrast, large majorities in Jordan, Lebanon and the Palestinian Authority see little danger from Syria; 60% or more in Jordan, the Palestinian Authority, Indonesia and Lebanon are unconcerned about Iran, and 57% in Pakistan also feel this way. SARS: A Connected World’s Downside? Anxiety about possible exposure to SARS is substantial in many of the nations polled this spring. 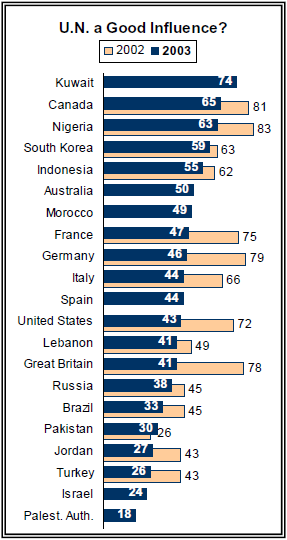 Worries are greatest in Nigeria (82% very worried), Kuwait (62%) and Russia (59%). About half of Indonesians and Turks are also very worried. 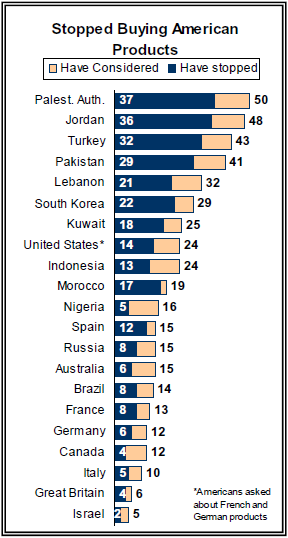 Majorities in Lebanon, Spain, Morocco, Italy, Jordan, Pakistan and France are at least somewhat worried. But the level of worry is not correlated with the actual rates of reported infections around the world. Of the 21 publics polled, Canada and the United States have reported the highest number of cases of the disease. 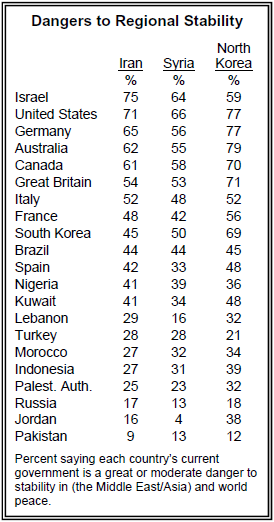 Worries in both countries are very low (9% “very worried” in each). Worries are also very low in South Korea and Australia, despite their proximity to China where the vast majority of the world‘s cases have been reported. Even though the connected world of global air travel has enabled SARS to spread more easily, opinions about connectedness are mostly unrelated to worries about SARS. In most countries, those who are worried about SARS are just as favorable about growing international trade and faster communication as those who are not worried about the disease.